Parenting can be a challenge at best, and down right frustrating and maddening at its worse. There may be times you may think your children will drive you crazy. You may go over the same struggles again and again. If you get to a point where you think you may have it right, off to a new set of struggles. These struggles can create a very stressful and negative family atmosphere. We didn’t get a parenting manual on how to do it right with our child / teen. What we do have is our own memories of how we were parented, and that may not be the best. But, this is often what we feel we are stuck with. This doesn’t have to be the case. There are two important contributions in recent times. One is what we professional’s have learned over the years about children, adolescence, and the parenting process. The second is the power of transferring that knowledge to parents through the coaching process. Parent coaching fills the gap that education leaves. It provides the help for specific issues you are challenged with. Here is you chance to seek help in these trying years through the use of an interactive, private, yet very personal process (live coach available at (866) 471-1220). You will find answers to your most demanding and frequently asked questions about parenting in the comfort of your own home. e-Parent Coach gives you the answers you need to navigate the perilous waters of parenthood. Answers which have been well tested through years of research, innovation, and application. Take the time to familiarize yourself with what e- Parent Coach can do for you. Although this is a fee based program, there is absolutely no charge for you to see what we can do for you through the use of this innovative and personal program. 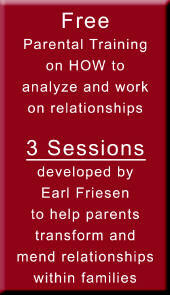 We want you to understand our purpose is to help make the parenting process understandable, practical, and successful. Find out more by simply following the linked buttons on the left. If you should choose to participate in this program, we are certain it will help you to become a better and more equipped parent, making your home life much less contentious. 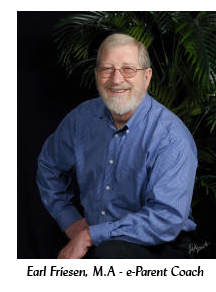 e-ParentCoach was developed by Earl Friesen, a licensed Marriage and Family Therapist since 1975.In private practice in Colorado Springs, CO, parenting is one of his specialties. Earl and his wife, Mary Anne have three adult children. They were also foster parents for five years. For additional information, visit his web site at www.lifeskillsplus.org. Our services go beyond Life Coaching and does include support for your daily lives and parenting. We would like to offer you online services where you can discover ways in which you may be able to work with goals and learn how to deal with difficult situations with your children and how to limit or eliminate your personal frustrations while dealing with them. Just click on one of the buttons below to go to our additional web sites.